"It just seemed like it was a very unsanitary way of storing meat," Pearl told CBC Toronto. "Fifty or 60 steaks in there, sitting in the cart without any wrapping that I had seen," he said. "It just seemed very, you know, very unhygienic and it looked disgusting, to be honest with you." "I showed her the picture. She seemed aghast at it all," Pearl said. "They got back to me and said they were going to be looking into it." 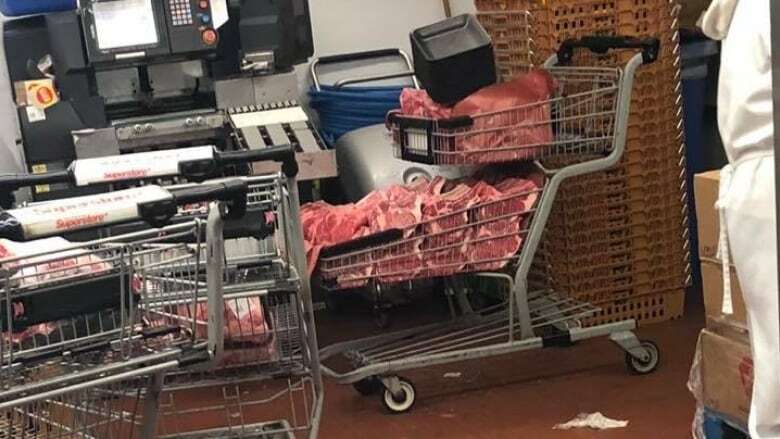 Loblaw Companies director of public relations Karen Gumbs also saw the picture and gave a statement to CBC Toronto, saying this "absolutely should not have happened" because it does not follow the company's food safety procedures. "The store immediately addressed this with the colleague," Gumbs said. "We've reminded all departments of our protocols to ensure nothing like this happens again." That was exactly the outcome Pearl was hoping for. "That's good," he said. "Hopefully, they follow through on it." Pearl says he will continue to shop at the Real Canadian Superstore because it's close and convenient. When asked if he plans to buy meat from the deli counter again he simply said, "Yeah, why not?"